In the energy sector, 2018 may well be remembered as the year which witnessed two historic decisions which may influence its economic direction for years to come. The first decision occurred on August 18, when a cross-border gas deal was signed with Venezuela to allow TT to process gas from the Dragon gas field. The Dragon field is part of the Mariscal Sucre natural gas complex off the Caribbean coast of Venezuela, northwest of Trinidad, and contains 2.4 tcf (trillion cubic feet). The second decision was described by Finance Minister Colm Imbert when in his 2019 budget presentation, he said state-owned oil company Petrotrin was “tottering on the brink” and in dire need of restructuring. That restructuring involved its total shutdown and remodelling on November 30, including its Pointe-a-Pierre refinery. The company subsequently morphed into the Heritage Petroleum Company and Paria Fuel Trading Company, which will handle exploration and production and trading and marketing respectively. Petrotrin as an entity will remain as a company to deal with legacy matters. The year began with West Texas Intermediate (WTI) crude oil trading at an average price of US$63.70. By year-end, WTI crude had declined to US$45.44. However, natural gas prices maintained an average price of US$3.70 per mmbtu (million metric British thermal units). Imbert, in the budget presentation, predicated the budget on an oil price of US$65 per barrel and gas price of US$2.75 per mmbtu. He cited the August gas signing with Venezuela, saying the project will start with 150.0 million standard cubic feet per day, with the possibility of that level rising to 300 million. The deal was signed by representatives of the National Gas Company (NGC), Venezuela’s state oil company PDVSA, and Shell, the multinational energy giant with the rights to drill the Dragon field. A special-purpose vehicle between Shell and NGC has been created to lay down the infrastructure. Shell’s pipelines, including those in the North Coast Marine Acreage will be used to transport Dragon’s gas to the Hibiscus platform off the northwest coast of Trinidad, only 18 kilometres away from the gas field. Other gas fields which boosted TT’s production include bpTT’s Juniper well, which came on stream in the latter half of 2017 and produces about 590 mmscfd. BPTT announced an investment programme of US$8.0 billion over the next ten years and has in place nine projects, including Juniper, now fully operational, and Angelin, which is scheduled to begin production in the first quarter of 2019. DeNovo also delivered first gas from its Iguana Field in the southwestern coast of Trinidad in late November. DeNovo, part the Swiss-based Proman Group, is now TT’s fifth natural gas producer, and has committed to delivering 80 million standard cubic feet of gas per day for use by petrochemical plants on the Point Lisas Industrial Estate. Iguana is the first west-coast natural gas field to be developed in TT. But it was Petrotrin’s closure which grabbed headlines as the year wound to a close, with the oilfield workers' union accusing government of misleading the public about the true state of the company. Meanwhile the employee base remained around 5,000, divided between the refining and marketing business unit and the exploration and production business unit. He said the monthly wage bill amounted to $183.0 million,or $2.2 billion a year. “There was no doubt at both the level of the company and the representative trade union – the Oilfield Workers’ Trade Union (OWTU) – that the business model in place at Petrotrin had become obsolete and uncompetitive,” he announced. He said closing the refinery was the “only commercially-sound and viable option” with the 40,000 barrels of local crude now exported and earning the country foreign exchange. The exploration and production activity, he said, would be aggressively pursued to increase production from the current low level of 40,000 to a minimum of 60,000 barrels per day. Meanwhile petroleum-based products produced by the refinery will now be imported through a new terminalling business unit and those products distributed to local and regional markets. The fuels include motor gasoline, diesel, aviation fuel, liquefied petroleum gas and other refined products. The termination package was estimated at approximately $2.6 billion, consisting of $1.8 billion for all employees under the separation packages in nine collective agreements, $555 million in back pay for all employees, $203 million in vacation pay for all employees and $30 million in ex-gratia payments for all contingent employees. However, the November 30 payment deadline was not met, and this resulted in employees staging several demonstrations with the aim of receiving their severance packages. 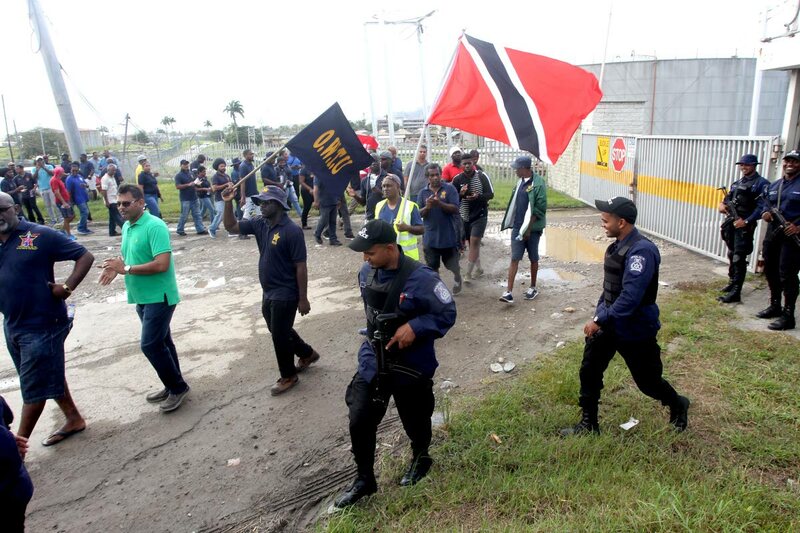 The union also staged a three-day march from Pointe-a-Pierre to Port of Spain in an attempt to convince the government not to close the refinery. The OWTU has also partnered with Caribbean investment bank SunStone Equity, based in Suriname, and MAK England, a commodities trading firm with operations in the UK, the US and UAE, to run the Pointe-a-Pierre refinery. A decision on that plan is still pending. Reply to "2 historic decisions impact energy sector"